What exactly is Swiss Design, anyway? Graphic designers hear the term Swiss Design all the time. Yet most of us, if asked to define it, could do no better than point to a rather vague, general gestalt: crisp, blocky layouts, a minimalist design ethos, and sans serif typefaces. Indeed, for many people, Swiss Design is basically synonymous with Helvetica—the very name of which in fact means “Swiss” (in Latin, Switzerland was the Confederatio Helvetica)—which was designed in 1957 and hit the market in 1960. The importance of Helvetica cannot be underestimated; the typeface is endlessly useful for everything from signage (look at the New York City subway, for example) to web pages to logos. But to really understand it, one must understand the greater tradition of Swiss Design. In a nutshell, Swiss Design was a movement that took hold in the 1950s in two Swiss art schools, the kunstgewerbeschule in Zurich, led by Josef Müller-Brockmann, and the Allgemeine Gewerbeschule in Basel, led by Armin Hofmann. Both of these instructors had studied with the great Ernst Keller in Zurich before World War II. These names will become more meaningful when we look at their work a little later. Their style, which was called the International Typographic Style at the time, was guided by the ethos that design should be as invisible as possible. All traces of the designer’s subjectivity should be suppressed in order to let the “content” of a work shine through. It is similar to the axiom of architectural modernism that form should follow function. In practice, what distinguished Swiss Design was the use of asymmetric layouts with text aligned flush-left, ragged-right; sans serif typefaces like Akzidenz Grotesk and, later, Helvetica (originally called Neue Haas Grotesk); the use of photographs instead of illustration; and, most importantly, the deployment of a mathematically determined grid to determine the placement of design elements—a method that remains extremely important to this day in web design. Many of these features have become so prevalent in design that we no longer think of them as distinctively Swiss. To get a sense of how distinctive they were at the time, however, let’s consider two American advertisements from the period—one pre-Swiss Design, one post-Swiss Design. This 1952 magazine spread has one special thing about it: the illustrator of the shoes is Andy Warhol, who would later become famous as a Pop artist. But besides that, it is pretty representative of design standards of the time: the text is in a book-style serif font; it is justified both left and right to create symmetrical rectangles; and it is illustrated by drawings instead of photographs. This iconic advertisement was designed by Helmut Krone, a New Yorker who was the son of German immigrants, for the Manhattan design agency Doyle Dane Bernbach. Without even getting to what makes the ad itself so brilliant, consider the design elements alone: here the illustration has become photographic and the typeface has become a sans serif. Overall, “design” in the traditional sense of the term has taken the backseat. The influence of the International Typographic Style is clear. Now we have a decent sense of what Swiss Design is. But the question remains, how did it develop, and why Switzerland? What’s so special about the Alps? To understand these questions we will need to first consider the design and art movements that motivated and inspired Swiss Design (whether as a negative or positive example) and then take a closer look at the Swiss Design movement’s specific protagonists and their accomplishments. The birth of graphic design as such can be dated to the 19th century, when “arts and crafts” and the “applied arts” first began to distinguish themselves from so-called “fine art” (i.e. painting, sculpture and architecture) and establish independent institutions of study. For whatever reason, this movement for the independence of design was strongest in the German speaking world and the English speaking one. For a snapshot of its effects in the early 20th century, we can consider one English movement, the Arts and Crafts, and one German one, the Jugendstil (or “youth style”). Swiss Design was a reaction against both of these. The Arts and Crafts movement in Britain was led by figures like William Morris. Morris believed that the mechanization of the industrial period had diminished the quality of craft work, and he urged a return to a Medieval model of artisanship. His book designs like the one above are clearly pre-modern in flavor. They incorporate tons of intricate patterns and illustrated detail. The Jugendstil, led by people like Henri van de Velde and the typographer Otto Eckmann, is generally seen as the Germanic equivalent of the Art Nouveau that reigned in France. It, too, is characterized by intricately hand-drawn floral motifs and pre-modern flourishes. Above all it was motivated by a desire to exalt the subjectivity of the artist or designer. Swiss Design rejects such attempts to replicate the crafts of a pre-industrial society and to privilege the subjectivity of the artist. Instead it embraces modernity and the clarity and anonymity of machine-based design. Swiss designers did not create this high-modernist approach out of nowhere. Rather, they looked to precedents at the intersection of art and design from the period spanning roughly 1914 and 1939. These included the movement of Suprematism and Constructivism in Russia, De Stijl in the Netherlands, and the Constructivism-inspired work of the Bauhaus, a design school founded in 1919 in Dessau, Germany. Inspired by the 1917 revolutions, Russian artists like Kasimir Malevich and El Lissitzky sought to re-define art for coming socialist era. Their solutions, Suprematism and Constructivism, utilized simplified geometric forms and strong, sans-serif typography placed in unusual configurations. Meanwhile in Holland, artists like Theo von Doesburg and Piet Mondrian established a movement that came to be known as De Stijl (or simply “the style”). Spanning architecture, painting and graphic design, De Stijl’s principles were rooted in mathematics and grid forms that served as compositional tools. The Bauhaus was established to provide a wide ranging curriculum for the arts and crafts, but under the directorship of the architect Walter Gropius, it became especially oriented toward architectural modernism. In this environment, artists like Laszlo Moholy-Nagy pursued variants of constructivism that internalized elements of both Russian constructivism and De Stijl, including simple geometric shapes, sans serif typography and grid organization. Thus, all the ingredients of Swiss Design were in place by World War II. Why did they happen to combine most fruitfully in Switzerland during the interwar and postwar periods? One possible explanation is the fact that Switzerland remained neutral during both conflicts. As a result it became a haven for intellectuals and a crossroads for ideas from many different places, from England and Holland to Germany and Russia. But the development of Swiss Design was more than a simple math equation. It resulted from the unique contributions of specific artists and designers whom we’ll look at here. Ernst Keller is in many ways the grandfather of Swiss Design. He took a position at the School of Applied Arts in Zurich in 1918, and from there he instructed the leading lights of the next generation, among them Müller-Brockmann and Hofmann. While Keller’s work has a different flavor than what would come later, his preferences for striking graphics, irregular layouts and sans serif typefaces were all clearly influential. Over in Basel, Armin Hofmann was exploring a similar but nonetheless distinctive approach. His work gives even greater weight to typography and employs striking tonal contrasts. Hoffman held a teaching appointment at Yale University in the mid 1950s, and was instrumental in bringing the Swiss style to the United States. It is only fitting to end this article on Swiss Design on a typographic note. Hevetica, which was designed by Eduard Hoffmann and Max Miedinger, is of course king, and deserves all of the praise it receives. But instead we’re going to look at its predecessor which was arguably more important: Univers. Designed by Adrian Frutiger in 1954 and ultimately released in 1957, Univers is a sans-serif typeface that served to update the almost 50 year old Akzidenz Grotesk. 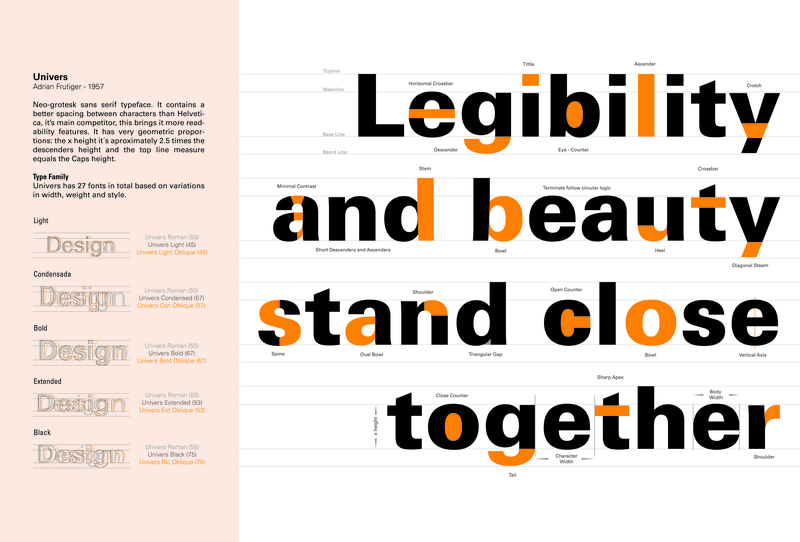 What made Univers such an important milestone is that it was the first megafamily typeface. Rather than coming in the usual three fonts—regular, italic and bold—it came in no fewer than 21 different weights, each labeled by a different number. This variety resulted in unprecedented flexibility for designers, who were now able to design an entire project using various fonts of a single typeface, rather than having to use a variety of typefaces in order to get all of the weights they wanted. This move turned designers’ attention to the possibilities of single typefaces in a completely new way. The path to Helvetica and Swiss Design dominance was set. How do you incorporate the principles of Swiss Design into your projects? Share in the comments! Thank you so much for your succinct yet articulate article. If I have to add up one more prominent Swiss master who laid a solid theoretical foundation for the Swiss typography, it must be Emil Ruder, the author of ‘Typographie’ (1967).